The Fatima Prayers are in the beginning of the book. See them below the Fatima coloring page. An Angel and Our Lady of Fatima asked three children to pray the Fatima Prayers one hundred years ago. The miracle in October helped millions of people to believe and to pray. 70,000 people witnessed it in 1917! Lady of Fatima coloring page. 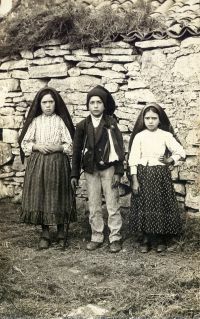 The Angel of Peace, Our Lady Herself, and at a later time, Jesus taught the three Fatima children several prayers for the First Saturday devotion. My God, I believe, I adore, I hope and I love Thee! I beg pardon of Thee for those who do not believe, do not adore, do not hope and do not love Thee! Most Holy Trinity, Father, Son, and Holy Ghost, I adore Thee profoundly and I offer Thee the Most Precious Body, Blood, Soul, and Divinity of Jesus Christ, present in all tabernacles of the earth, in reparation for the outrages, sacrileges, and indifferences by which He Himself is offended. And by the infinite merits of His Most Sacred Heart and the Immaculate Heart of Mary, I beg of Thee the conversion of poor sinners. O my Jesus, it is for Thy Love, for the conversion of sinners, and in reparation for sins committed against the Immaculate Heart of Mary. O my Jesus, forgive us. Deliver us from the fire of Hell. Draw the souls of all to Heaven, especially those in greatest need. Sources for Fatima Prayers: Mother of Christ Crusade booklet, Imprimatur 1947. 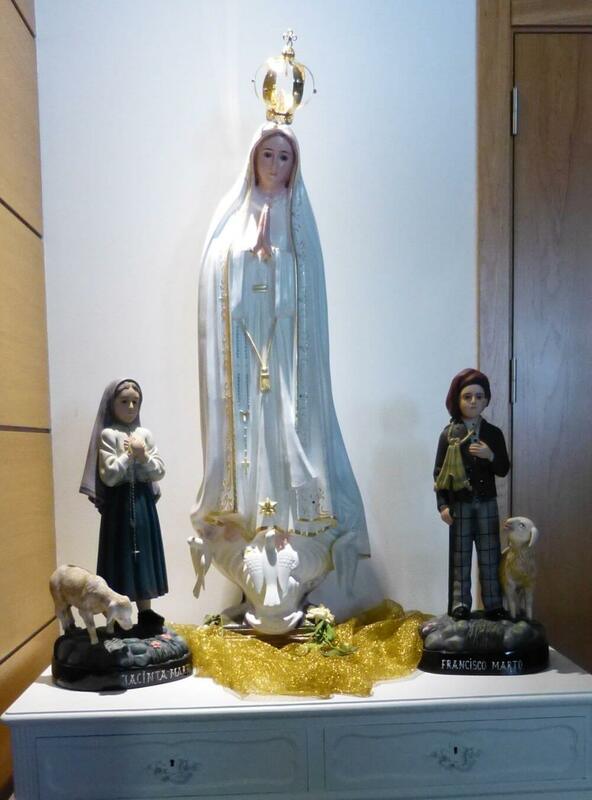 The story of Our Lady of Fatima begins in Portugal before 1917 when the Angel of Portugal appeared to three Fatima children in the spring of 1916 and asks them to pray the Fatima prayers. Then between May and October 1917, Our Lady appeared six times to the children in a field called the Cova de Iria, near Fatima. They were Lucia dos Santos and her two younger cousins Francisco and Jacinta. They played while they tended the families' sheep and would frequently pray the Rosary, sometimes in a careless and childlike way. In all her appearances at Fatima, the Blessed Mother repeatedly emphasized the necessity of praying the Rosary daily, of wearing the Brown Scapular of Mount Carmel and of performing acts of reparation and sacrifice. Later she asked for the First Saturday devotion. 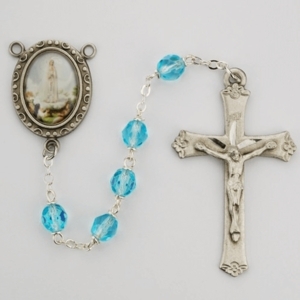 At the final apparition, October 13, 1917, she identified herself as "Our Lady of the Rosary". 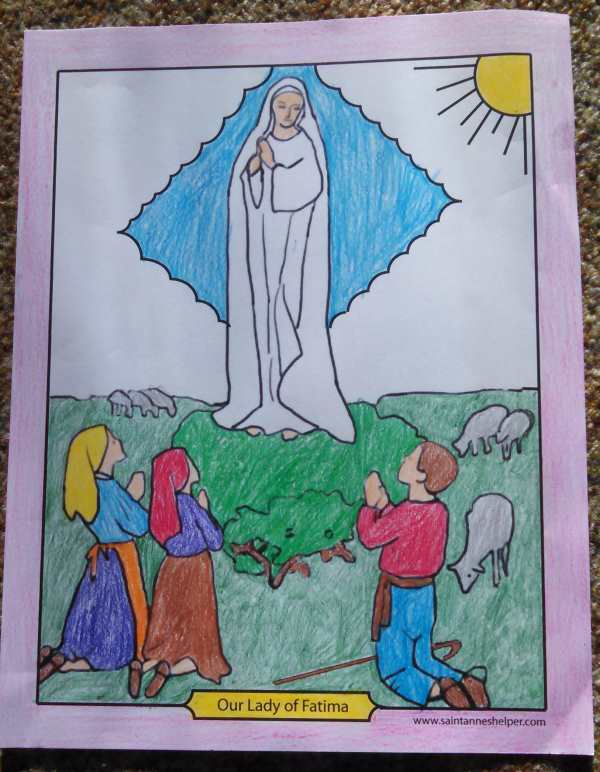 The Fatima Miracle, the Miracle of the Sun, confirmed what the children had been saying. Again, 70,000 people saw the miracle. The sun seemed to rush toward the earth in swirling brilliant colors. The people fell to their knees to pray for mercy. The rain that had drenched the fields and the pilgrims had entirely dried when the sun resumed its place. To prevent the terrible chastisement at the hands of Russia and to convert "that poor nation", Our Lady requested the solemn public Consecration of Russia to Her Immaculate Heart by the Pope and all the Catholic bishops of the world. She also asked that Catholics practice devotion of reparation on the first Saturday of five consecutive months to her Immaculate Heart ("The Five First Saturdays"). "If My requests are not granted, Russia will spread its errors throughout the world, raising up wars and persecutions against the Church. The good will be martyred, the Holy Father will suffer much and various nations will be annihilated." First Saturday is a large part of the answer to this evil. In the course of the next thirty years, Our Lady and Our Lord appeared to Sr. Lucia several times. 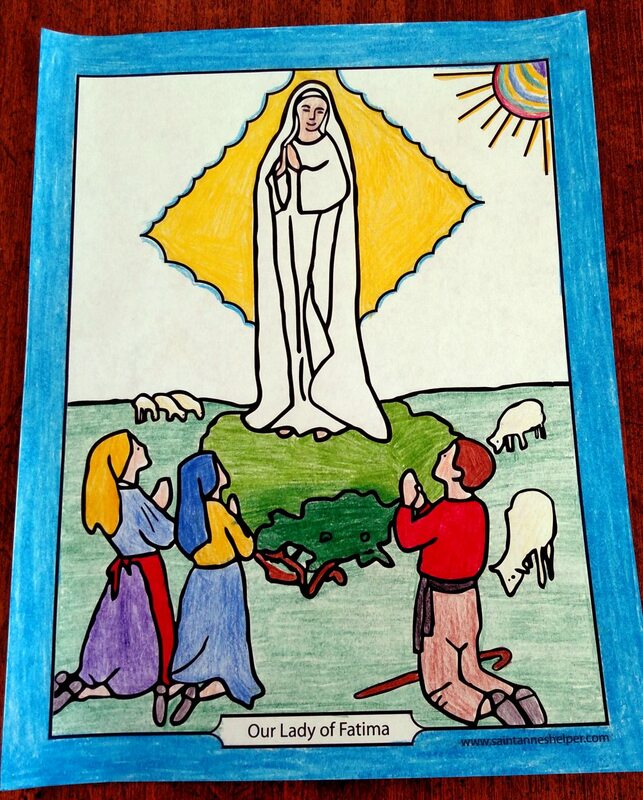 Click here for an Our Lady of Fatima Portugal coloring page. We can see with some of our website tools that not many surf the net looking for the First Saturday devotion. Of course, we understand that the internet is no place to be looking for devotions; yet it can be a good place to find references to sources for First Saturday, so that we can share the information with our family and friends again through the internet. We can email our family and friends and share on Facebook and Twitter. The first Fatima prophecy has already happened (World War II). We should be praying as Our Lady requested, because in many ways we see the many errors of Russia expanding throughout the world even the Russian Pavlovian behavior psychology being used in our institutions of the military, health, and education. I hope we will all remember the Fatima Prayers and Our Lady's requests. "If My requests are granted ... there will be peace." Please, please, please make these devotions in honor of Mary's Immaculate Heart and encourage your family and friends to do the same. We offer a free monthly Catholic Holy Days Of Obligation Reminder which also lists the dates for the First Friday and Saturday Devotion each month. Pray the Fatima prayers with your Rosary. It is a consolation to us in our family that we have each done the Five First Saturdays at least once. We can always improve our devotion, so we try to repeat this devotion every year. You can do the same. We attached our weekly holy hour to the hour after Saturday morning Mass. This can make it easier for you not to miss Mass and Communion on the First Saturdays. After each of your children receive his or her First Communion, you can make commit to making all Five First Saturdays and the Nine First Fridays - complete with confession, communion, Rosary, and meditations. Teach your children the Fatima Prayers. 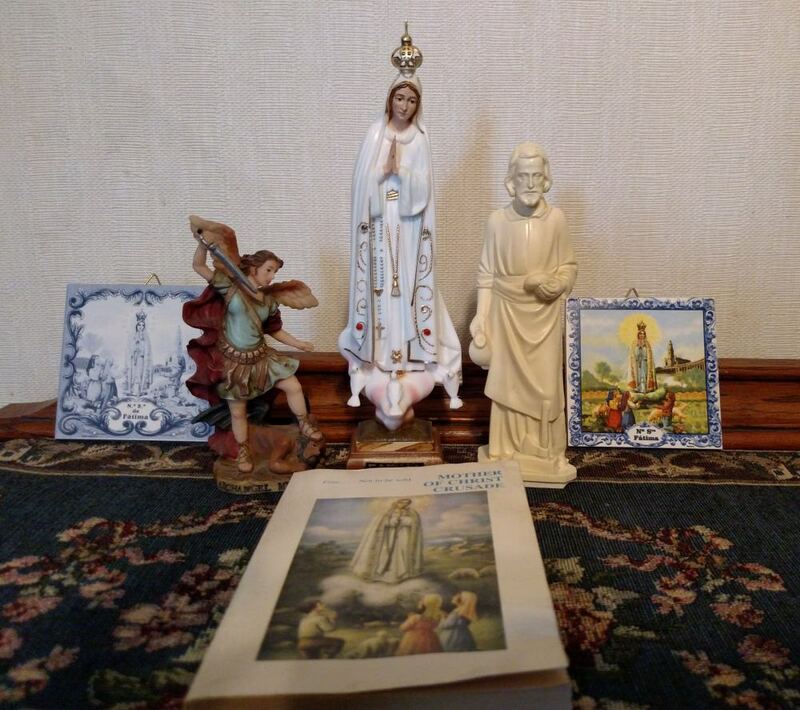 Keep a Fatima statue near where you say your family Rosary. Mark your Missal for the Saturday Mass "Salve Sancta Parens" and the Immaculate Heart of Mary to remember to offer your communion in reparation to the Immaculate Heart of Mary. A simple IHM can help. Make a chart to keep track of your family's confessions, communions, Rosaries and meditations; or keep it on your calendar. Keeping track each time can be tricky, especially as your family grows older. Use a chart or your calendar to tally who went to confession and communion each month. There's almost two weeks to make it to confession. Sometimes you may need the full two weeks depending on whether you have bad weather, babysitters, and school and work schedules that prevent going to confession in any one month. It's worth the effort to track the details because it is so discouraging to have to start over after you miss a Saturday. If you want to do the Nine First Saturdays, see the devotion to the Sacred Heart of Jesus here. The Fatima prayers are in the book that Mother of Christ Crusade printed decades ago. 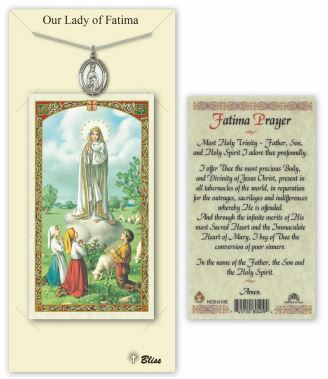 The book has the prayers within the story of Fatima, so the Angel prayers are with the Angel's apparition. The book has an Imprimatur of 1947 and one of the pictures of Jacinta and Francisco's brothers is dated as 1966. It has wonderful black and white photos. It is one of the nicest Fatima books I've read. You'll love reading it to your children. A century ago Our Lady of Fatima made prophecies and promises. 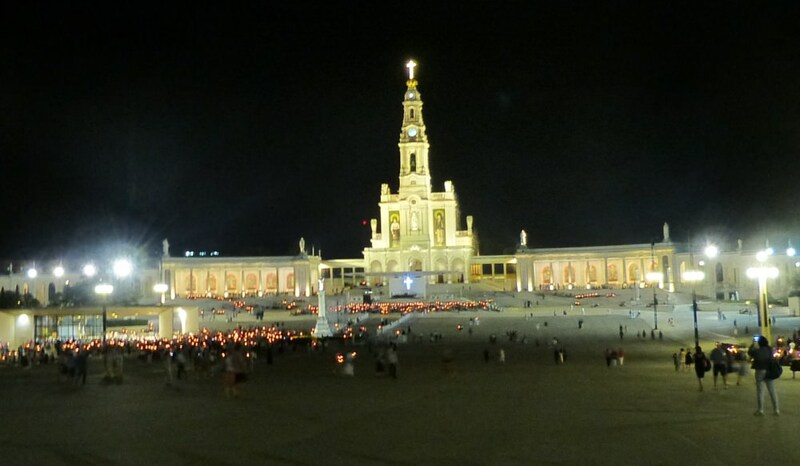 Many people make a pilgrimage to Fatima to learn more about her during the Centenaire de Fatima. 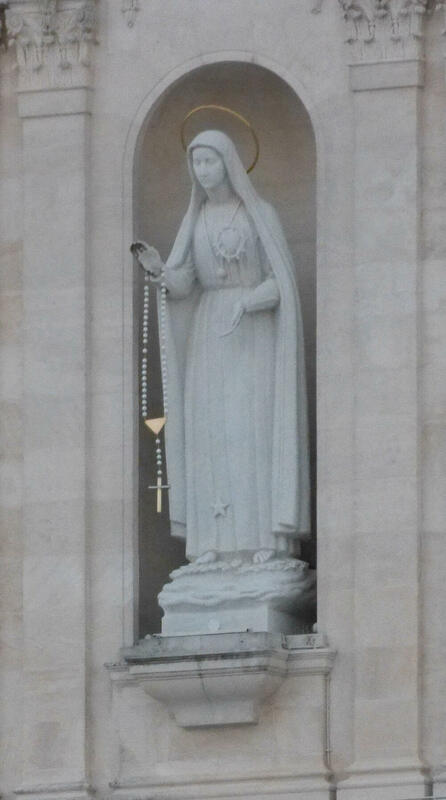 These Fatima pictures were taken near the Santuario de Fatima during. Maybe you will visit Fatima someday. Click on a photo to see a gallery of pictures. 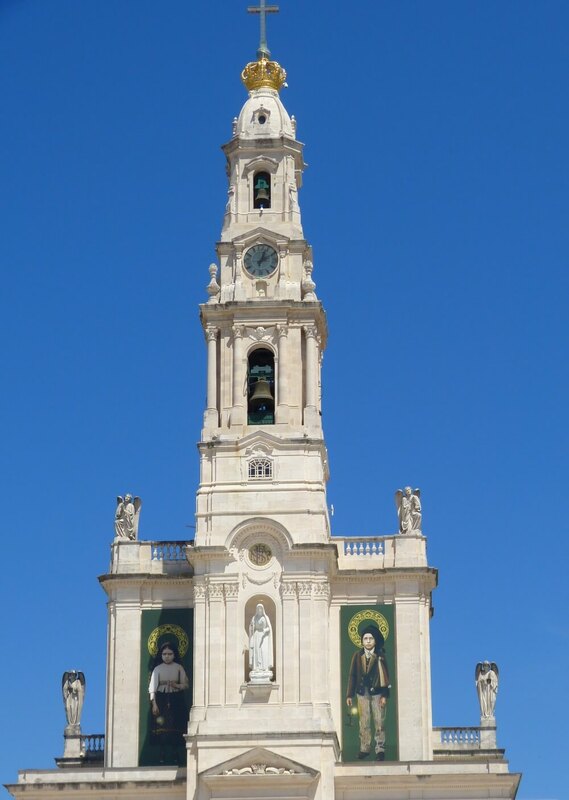 The bell tower at Our Lady of Fatima Church in Fatima, Portugal during the 100th Anniversary of Fatima, the Centenaire de Fatima. The Virgen de Fatima statue in the bell tower during the 100th anniversary of Fatima 2017. 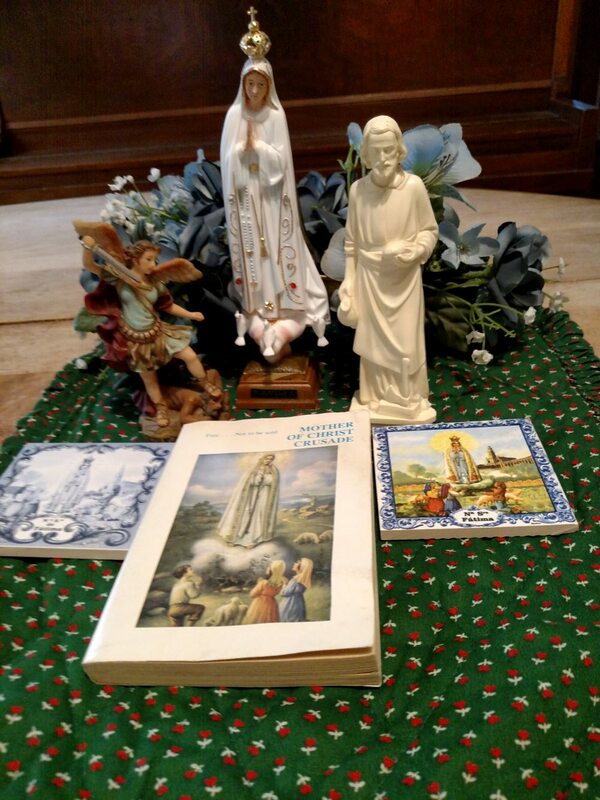 Beautiful altar to Our Lady of Fatima and the children of Fatima. 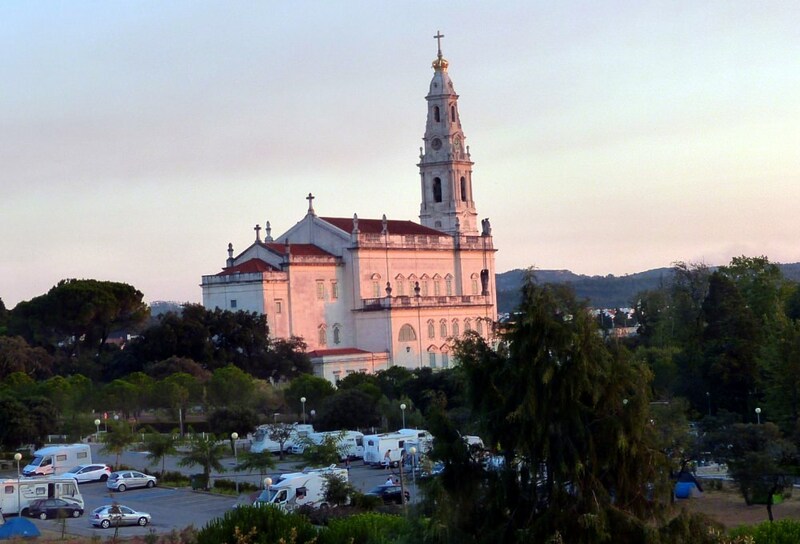 Fatima City: Morning view of the church from the city of Fatima. 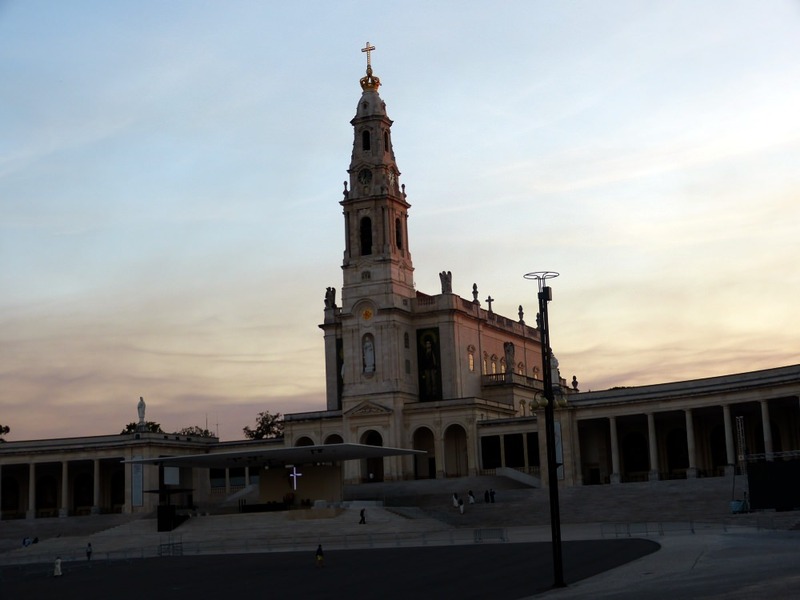 Santuario de Fatima: August 2017 hundred year anniversary of Fatima at twilight. Pilgrimage to Fatima - 2017 candle lit procession in honor of Our Lady of Fatima. This Fatima documentary film tells the story of Fatima along with the story of Lenin's rise in Russia. It compares what happened in Fatima at the same time as the happenings during WWI in Europe and in Russia. St. Gabriel Media in Farmington, Michigan made it in 1984. In the film Ricardo Montalban narrates video clips from Cardinals, Bishops, and priests from Fatima and Portugal; Dr. Warren Carroll; Dr. Hitchcock; and Alice von Hildebrand. These interviews bring the story current to the early 1980s. You will love the interviews with a priest who had seen the Miracle of the Sun and several of the children's cousins who also had witnessed the event. It also uses images from the Warner Bros. 1952 Fatima movie, Miracle of Our Lady of Fatima. Note Bene: There are military and revolutionary clips that would scare younger children. Otherwise, it is very factual. It's a great explanation for high school and older. In Memoriam: Please pray for the repose of the soul of my uncle Fr. John Cain. He gave us this Fatima statue on the occasion of our wedding. He also gave us a tiny book with the Fatima prayers. He was a pastor and with a generous soul. He was a very industrious priest. For example: he and his congregation built a Catholic school in Gilmore City at St. John the Evangelist. Our Lady of Fatima, pray for him. 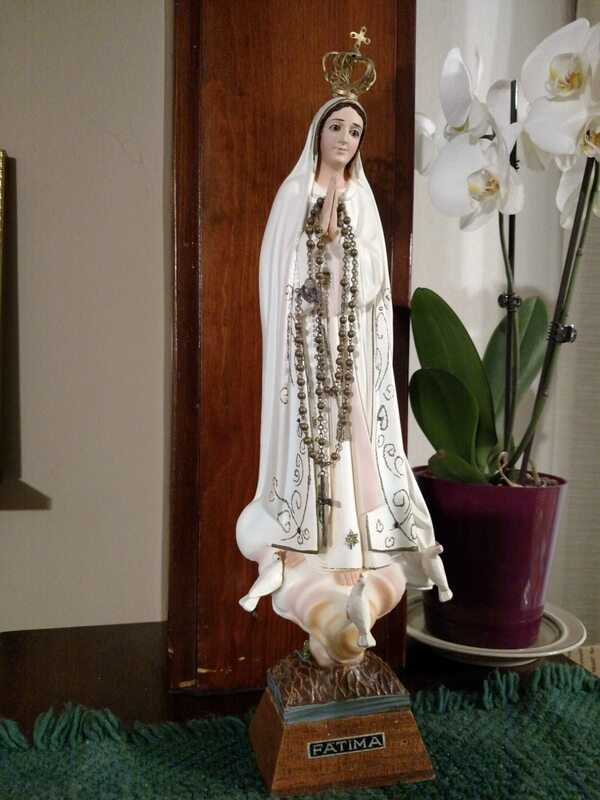 A Fatima Statue can help you remember to pray the Fatima prayers with your Rosary.